Venturing into the lifestyle segment, Splash the Middle East high-street retailer has announced the launch of its perfume line, as part of its growing business. 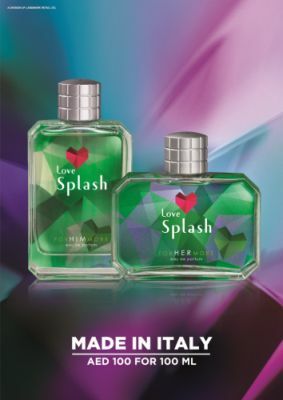 Titled Love Splash, the range consists of two variants namely Classic & Sport for both men and women. The perfume has been created exclusively for Splash by perfumer Sergio Momo from Italy bringing in the fashion element via packaging and design and ensuring quality and price levels are met via the scents produced. For those who prefer something old-school and classy, the Classic range is what you’re looking for. Expect a crispy scent that’s feminine and oozes sensuality which is a mix of headnotes consisting of White Tea, Bergamot and tangy Tangerine. The men’s variant is a powerful fragrance without being overwhelming with hints of Bergamot, Elemi and Grapefruit as the head-notes. Showcasing popular collections for men, women and teens, Splash’s existing product portfolio includes a uni-brand concept across its stores providing a comfortable and easy shopping environment. Alongside, the brand also houses a gamut of international brands under its portfolio like Lee Cooper, Bossini, ELLE and Being Human among others. Splash has announced the gorgeous Arab singer & actress Nicole Saba as its brand ambassador along with Bollywood heart-throb Salman Khan and Bollywood beauty Esha Gupta. The brand is also celebrating ‘In Love with Fashion’. As a brand Splash believes in constantly being a trend-setter in the region and has successfully created some of the biggest and most popular brand properties/events like the bi-annual fashion shows, the Limited Edition Calendar launches which have now become part of the social calendar of the Region. With constant revamping of the marketing portfolio, newer forms of communication are added and channeled to keep the consumer involved. Over the years, Splash has received several significant industry accolades that include being awarded the “Superbrand” status 2014 which is fifth in a row for the brand along with a ‘Powerbrand’ status for 2013. Splash has also won the Dubai Lynx Awards in the Design category for the Splash 2014 calendar. Also listed in Forbes Arabia’s “Top 40 Arab Brands” list, Splash has also been awarded at the Grazia Style Awards 2010, as ‘Best place to Spend AED 500’. A winner of several marketing awards of great significance, Splash has also won the Most Admired Marketing Campaign at the Retail ME Awards 2011 along with the Most Admired Retailer award.